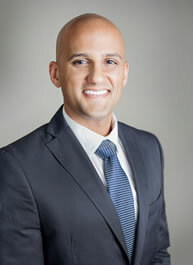 Originally from Los Angeles, Dr. Parikh is an expert in the diagnosis and treatment of disorders of the spine, musculoskeletal system and other pain conditions. His clinical focus combines evidence-based treatments, rehabilitative approaches to pain, and interventional procedures to manage complex pain cases. After graduating from medical school with honors, Dr. Parikh began his training by completing a surgical internship at the Mount Sinai School of Medicine in Manhattan, New York and stayed on to complete a postdoctoral research fellowship where he became published in a number of medical journals. Dr. Parikh then completed his residency in PM&R at the SUNY Upstate Medical University, and was given the distinguished honor of serving his last year as Chief Resident. He is Board certified by the American Board of PM&R. Later, he continued at the SUNY Upstate Medical University to complete his sub-specialty fellowship training in interventional spine and pain management. Dr. Parikh is a compassionate physician and is seeing patients at our Flamingo Campus.